Teamwork with Robots - Lionel P. Robert Jr.
Human-robots teams are increasingly being used in dynamic environments to tackle complex tasks. First-responder teams are saving lives by coordinating their actions through robots and drones. 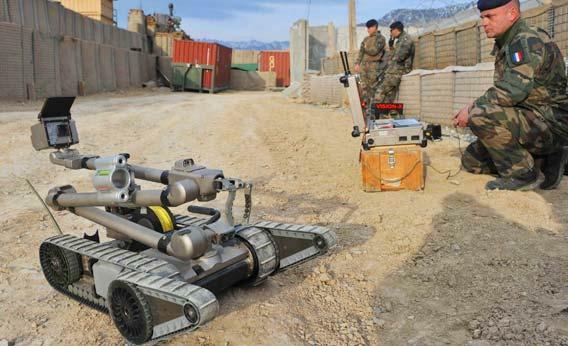 Police officers are employing remote-control robots to counter acts of terrorism. Construction teams collaborate through their robots to bring down concrete walls from a safe distance. NASA is employing remote-control robots to aid in space exploration. In all of these cases lives are at risk and hinge on the ability to effectively deploy robots. Unfortunately, advances in robotics have far exceeded our understanding of how these collaborative technologies can be leveraged. My research in this area explores highly significant questions at the dawn of an era of human-robot collaboration. As robots become increasingly central to our society it seems timely and important to understand how to effectively employ these robot. This research has the high-impact potential to reshape what we know about collaborative work. You, S., Kim, J., Lee, S., Kamat, V., Robert, L. P. (2018). Enhancing Perceived Safety in Human–Robot Collaborative Construction Using Immersive Virtual Environments, Automation in Construction (AutoCon), 96, pp.161-170 (pdf), link to the article on publisher's site: https://doi.org/10.1016/j.autcon.2018.09.008 link to copy provided by the author: http://hdl.handle.net/2027.42/145620. Robert, L. P. (2018). Motivational Theory of Human Robot Teamwork, International Robotics & Automation Journal, (IRAJ), 4(4), pp. 248-251 (pdf), link to the article on publisher's site https://doi.org/10.15406/iratj.2018.04.00131 link to the author's copy http://hdl.handle.net/2027.42/145157. Journal of the Association for Information Systems, (JAIS),19(5), pp. 377-407 (pdf), link to JAIS http://aisel.aisnet.org/jais/vol19/iss5/2 link to the preprint version http://hdl.handle.net/2027.42/136918. Robert, L. P. (2017). The Growing Problem of Humanizing Robots, International Robotics & Automation Journal, (IRAJ), 3(1), (pdf), link to the article on publisher's site http://dx.doi.org/10.15406/iratj.2017.03.00043, link to the author's copy http://hdl.handle.net/2027.42/138018. You, S. and Robert, L. P. (2017). Teaming Up with Robots: An IMOI (Inputs-Mediators-Outputs-Inputs) Framework of Human-Robot Teamwork, International Journal of Robotic Engineering, (IJRE), 2(3), (pdf), SSRN's Robotics eJournal Top Ten download list for CompSciRN Topic: Human-Robotic Interaction, 4 April 2019 link to the article on publisher's site ijre-2-003 link to the author's copy http://hdl.handle.net/2027.42/138192. You, S. and Robert, L. P. (2019). Trusting Robots in Teams: Examining the Impacts of Trusting Robots on Team Performance and Satisfaction, In Bui, T.X. & Sprague, R.H. (Eds. ), Proceedings of the 52th Hawaii International Conference on System Sciences, pp. 244 – 253. (HICSS 2019), (pdf), Jan 8-11, Maui, HI. Retrieved from URL: http://hdl.handle.net/10125/59465 and link to copy provided by the author: http://hdl.handle.net/2027.42/145619. Robert, L. P. (2018). Personality in the Human Robot Interaction Literature: A Review and Brief Critique, Proceedings of the 24th Americas Conference on Information Systems, (AMCIS 2018), (pdf), Aug 16-18, New Orleans, LA. SSRN's Top Ten download lists for: Cognition in Mathematics, Science, & Technology eJournal, Psychological Anthropology eJournal and Robotics eJournal, 21 March 2019 link to AIS eLibrary http://aisel.aisnet.org/amcis2018/DataScience/Presentations/24/ copy provided by the author: http://hdl.handle.net/2027.42/143811. Slides to the AMCIS 2018 Presentation (pdf). You, S. and Robert, L. P. (2018). Human-Robot Similarity and Willingness to Work with a Robotic Co-Worker, Proceedings of the 13th Annual ACM/IEEE International Conference on Human Robot Interaction (HRI 2018), (Acceptance rate: 23%), (pdf), March 5–8, 2018, Chicago, IL, USA, copy provided by the author: http://hdl.handle.net/2027.42/140719 and the link to the ACM Digital Library: https://doi.org/10.1145/3171221.3171281. You, S., Ye, T., Robert, L. P. (2017). Team Potency and Ethnic Diversity in Robot-Supported Dyadic Teams, Proceedings of the 38th International Conference on Information Systems (ICIS 2017), Dec 10-13, Seoul, Korea (pdf). Link to copy provided by the author http://hdl.handle.net/2027.42/138124. You, S. and Robert, L. P. (2017). A Working Framework for Human-Robot Teamwork accepted to the Robots in Groups and Teams Workshop at 20th ACM Conference on Computer Supported Cooperative Work and Social Computing (CSCW 2017), Portland OR. Link to the paper: http://hdl.handle.net/2027.42/135719. You, S and Robert, L. P. (2016). Curiosity vs. Control: Impacts of Training on The Performance of Teams Working with Robots in the Proceedings of the companion publication of the 19th ACM Conference on Computer Supported Cooperative Work and Social Computing (CSCW 2016), San Francisco, CA, (pdf). http://dx.doi.org/10.1145/2818052.2869121 and the link to the copy provided by the author: http://hdl.handle.net/2027.42/116395. Robert, L. P. and You, S. (2015). Subgroup Formation in Teams Working with Robots in the Extended Abstracts of the 33rd ACM Conference on Human Factors in Computing Systems (CHI 2015), April 18-23, 2015, Seoul, South Korea, (pdf). The link to the copy provided by the author: http://hdl.handle.net/2027.42/111882 and the link to ACM Digital Library http://dx.doi.org/10.1145/2702613.2732791. Kim, J., You, S., Kamat, V., Sanghyun Lee, S. and Robert, L. P. (2015). Evaluation of Human-Robot Collaboration in Construction Environments Using Immersive Virtual Environments in the International Conference on Construction Applications of Virtual Reality, (CONVR 2015) (pdf) http://www.convr2015.com/wp-content/uploads/2015/10/Web-Proceedings-CONVR2015.pdf (See page 132). Robert, L. P. and You, S. (2014). Human-Robot Interaction in Groups: Theory, Method, and Design for Robots in Groups in the 18th ACM International Conference on Supporting Group Work (GROUP 2014) (pdf). November 9–12, 2014, Sundial Island, FL, USA. The link to the copy provided by the author http://hdl.handle.net/2027.42/116271 and the link to the ACM Digital Library http://dx.doi.org/10.1145/2660398.2660426. You, S. and Robert, L. P. (2017). Facilitating Employee Intention to Work with Robots, presented at the Twenty-First Diffusion Interest Group In Information Technology Workshop (DIGIT 2017), Dec 10, Seoul, Korea (pdf), copy provided by the author: http://hdl.handle.net/2027.42/139708. You, S. and Robert, L. P. (2016). Trust in Teams Working with Robots to be presented at the 2016 Annual SIG Cognitive Research Workshop, (IS-CORE 2016), (see pages 2-3) Dublin, Ireland.